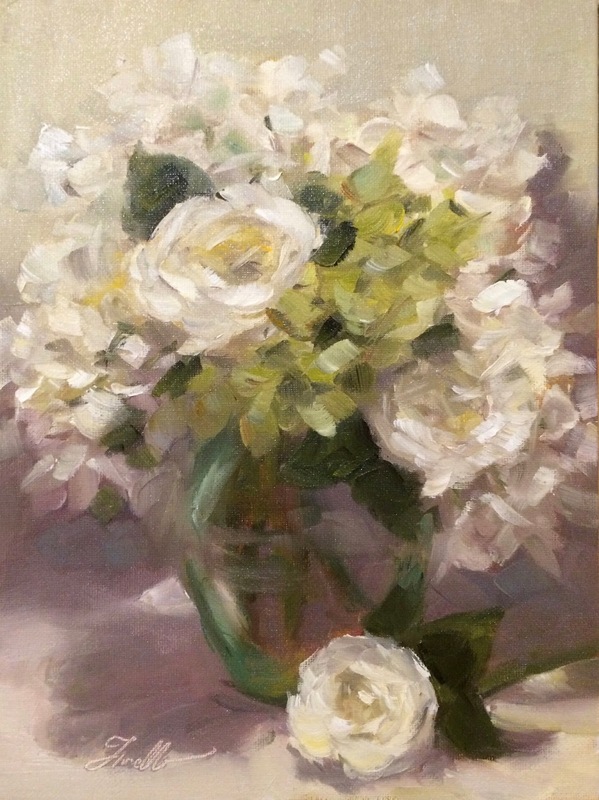 Wanted to create an elegant, peaceful feeling painting of roses and hydrangeas. Below is my set up and steps along the process in creating this painting. Note photo's exaggerate lights and darks so didn't want things to be quiet as dark as they appear in the photo of the set up. The set up, lighting from overhead. Initial general drawing- get things in the ballpark of where they will go. Added lights, block in complete. From here is a process of refining shapes to resolve things to the level desired. June Joy! 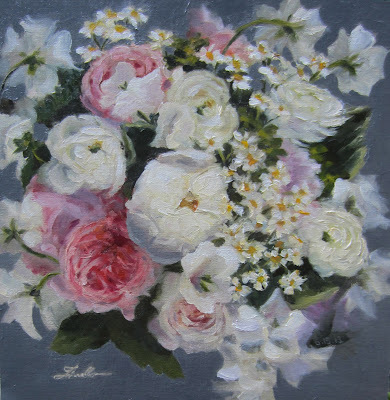 is a recent bridal bouquet painting that a loving husband commissioned as a special gift for his wife. He asked if I could include their wedding date in the painting somehow. The date is embedded in a leaf, so it's there if you're looking for it, but not too obvious to take away from the flowers. 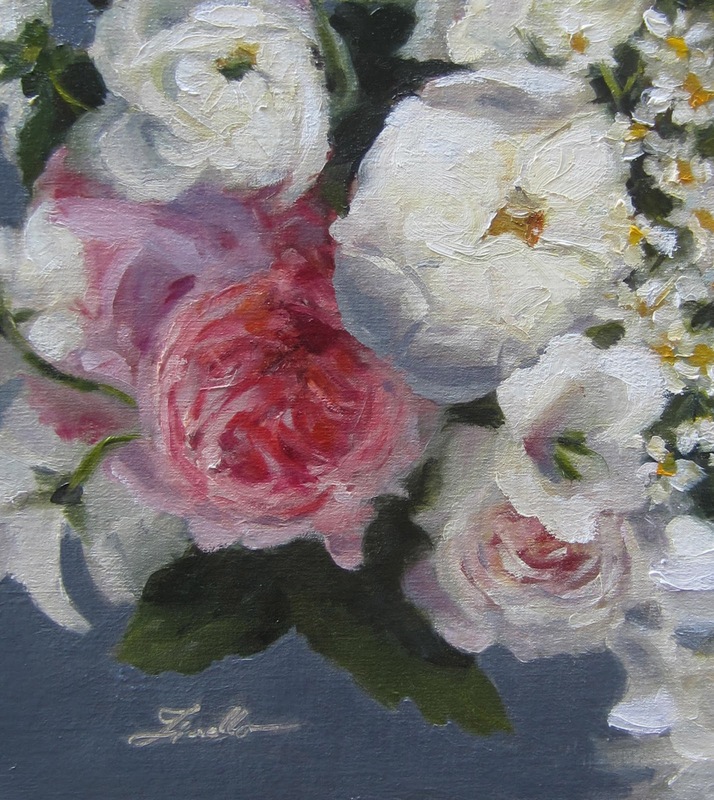 A beautiful collection, primarily peonies, roses, sweet peas and ranunculus. 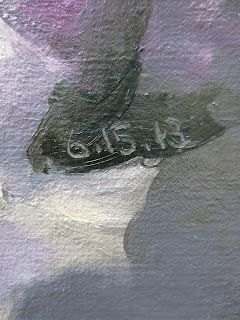 Some close ups of the painting are below. If you'd like to arrange for a special painting to be created for someone you love, please contact me directly. Click here for more on my "Forever Bouquet Paintings"